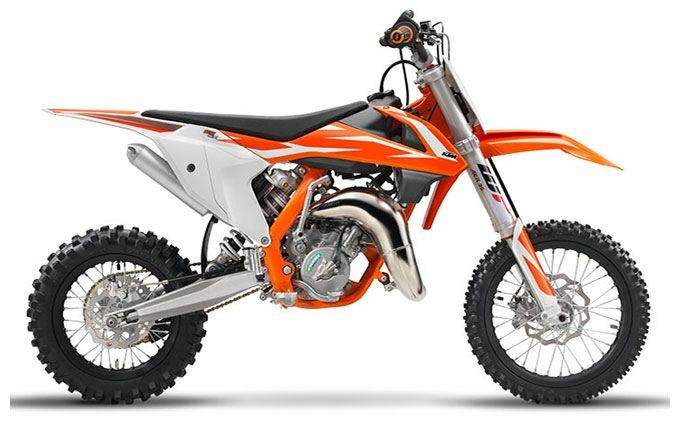 FRONT SUSPENSION: The new 65 SX is the first model in its class fitted with a modern, fully adjustable air fork: the AER 35, made by WP Suspension. Beside a massive weight reduction of 1.6 lb., the newly developed upside-down front forks with 35 mm tube diameter and 215 mm of travel ensure outstanding comfort, damping characteristics and directional stability. 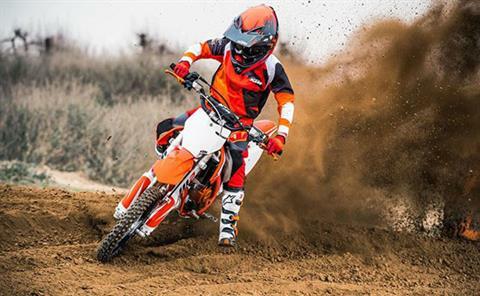 Another main benefit for junior riders is that the air spring fitted in the left fork leg can be adjusted perfectly and simply to the rider’s weight just with an air fork pump. REAR SUSPENSION: On the rear wheel a WP shock absorber linked directly to the swingarm provides excellent damping performance and is fully adjustable in order set the damping perfectly to rider’s preferences and track conditions. The rear wheel travel is 270 mm. 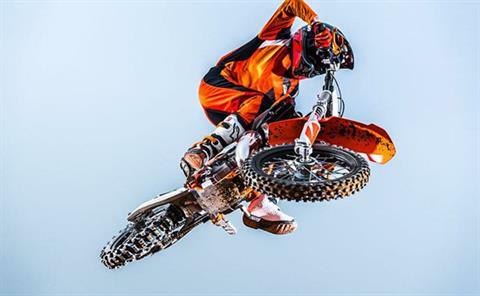 BRAKES: The 65 KTM SX is fitted front and rear with massive 4-cylinder calipers that grip lightweight Wave brake discs of 198 mm front and 160 mm rear diameter. The hydraulic brake system is easy to control and ensures the best deceleration and the highest standard when it comes to feel and force. 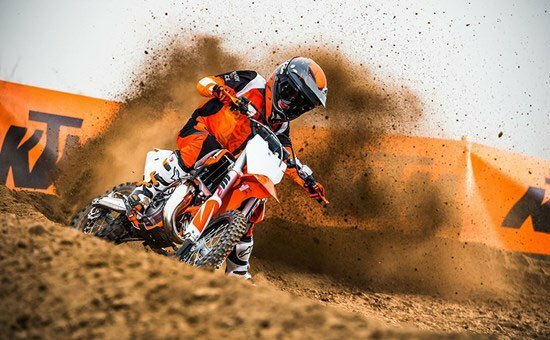 ENGINE: The 65 SX benefits from cutting-edge 2-stroke technology and an easy to shift 6-speed transmission with a hydraulic clutch. The cylinder, with its pressure controlled exhaust valve, provides class-leading power and plenty of torque. GRAPHICS: Derived from the full-size SX bikes, the graphic design makes the new 65 SX look even cooler. Its frame has a super rugged polymer coating in cheeky black. RADIATORS: An intelligent cooling circuit with integrated crankcase cooling and two radiators improves the heat dissipation and ensures a constant temperature balance for consistent, high performance. Front - 1.6 x 14 in. Rear - 1.6 x 12 in. Chain - 0.5 x 0.25 in.